It is with certain sadness that in 2019 we have had to withdraw from Fairtrade and are now no longer a Licensee. In the next weeks all our lab els will be gradually adjusted to reflect this, however we continue to source from these same estates and our teas continue to be organic certified. In the last couple of years Fairtrade have reorganised the way in which they structure the license and administrative side of the organisation. As a part of this the rules applied to the License fees have changed. To be clear the License fees are separate from the Social Premium, that is paid direct to the Producer groups. Within these new rules license fees have been split up and now those who trade direct, like the Bristol Tea Company, are obliged to pay a considerable flat fee rather than a percentage of sales. The Bristol Tea Company is a small business and these new prices sadly make Fairtrade license prohibitive. When I set up the tea company in 2011 I was keen where possible to source under the Fairtrade mark, though it is fairly unusual to find high grade loose leaf teas being offered as Fairtrade. Having spent a bit of time at the Makaibari estate I knew that there could be a number of benefits and I wanted the company, in its small way, to be part of this movement – though we have to be careful not to overstate its impact on the large tea estates. Big business, government, organisations like Fairtrade and the Ethical Tea Partnership as well as small retailers and consumers all have a role to play in calling for better welfare and livelihoods for those working in tea plantations. However I am interested in engaging in the debate around Fairtrade and just as my own knowledge of tea and the industry has grown enormously since 2011 so has my understanding of Fairtrade. “Fairtrade is about better prices, decent working conditions, local sustainability and fair terms of trade for farmers and workers in the developing world. Tea is graded and the Bristol Tea Company pay premium rates for the highest grades of organic, orthodox loose leaf tea. On top of this, where purchasing directly under the Fairtrade scheme, we pay the mandatory ‘Social Premium’ into a separate account administered by the tea estates ‘Joint Body.’ This Joint Body is a democratically elected committee made up of managers and worker representatives and the Social Premium may only be spent for the benefit of those workers, their families and local communities. At Makaibari, for example, the Joint Body has funded a number of community projects to improve and develop the social welfare of those living in and around the estate. It has helped to improve a health centre, with training for several women in basic health care and midwifery. There is now a library with computers on the estate. 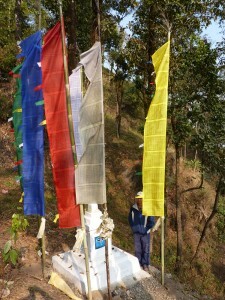 Over the years electricity has been brought to all the villages and flush toilets have been introduced. The fund has introduced low interest micro-loans to enable some residents to create their own small businesses, whilst also distributing money so people can improve their housing. Interest free educational loans are also available. 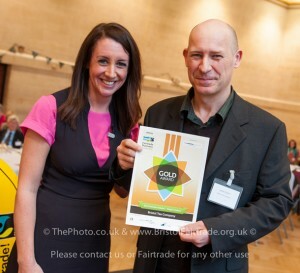 James receiving a Business Fairtrade Award from The Guardian journalist Lucy Siegle. To gain certification estates need to comply fully to Fairtrade standards and beyond economic development, as outlined above, the standards cover social and environmental development. Social development includes the guarantee of fair conditions of employment, health and safety in work and no forced or child labour. Meanwhile environmental development covers farming practices and the protection of the natural environment. These standards promote the reduction in the use of chemical fertilisers and insecticides, encouraging organic practice where possible. GM seeds are prohibited and where chemicals are used there are specific health and safety regulations the estates have to meet. The vast majority of tea throughout the world, and especially in India, continues to be grown on large estates under Company or Private management. Currently In Assam there are only 12 estates working with Fairtrade out of approximately 950 and only 4 of these are also organic certified. One of these is the Jamguri Estate, where one of our teas comes from. But none of these estates can be defined as a small tea grower or co-operative. Furthermore, whilst tea estates often manufacture both high grade orthodox teas and CTC (Crush, Tear and Curl) teas for blending and teabags those committed to Fairtrade might only sell a small percentage under the scheme. During my visit to Jamguri I found that Social Premium payments had only managed to finance small, though worthwhile, projects. The general method of manufacturing tea has changed little since factories were established in India in the 19th century and it remains a very labour intensive industry. 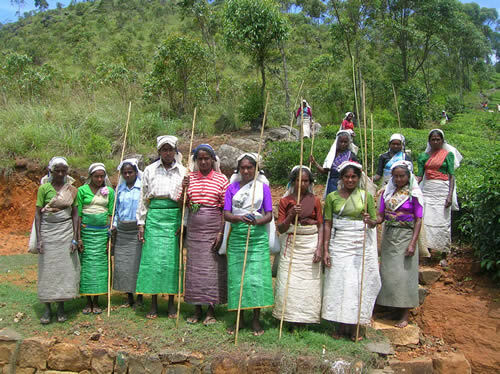 Though important legislation, such as the Plantation Labour Act, has been introduced tea pluckers remain some of the poorest workers in the world. Workers and their families live in villages within the boundaries of the estates, passing on their houses and jobs. Harvesting the leaves is skilled but monotonous and arduous work and most of those plucking the leaves 7 to 8 hours a day, 6 days a week are women paid very little. Husbands and sons might find work in the factories or beyond the estate but in Darjeeling, for example, there is high male unemployment in the estates. And whilst certain in kind benefits such as housing, drinking water, power and firewood are provided, on top of the very low wage, these provisions are stipulated under Indian law. Recently Equal Exchange, a Fairtrade retailer, withdrew their teabags from certification concerned that the founding principles focusing on small tea producers and co-operatives are being eroded. Indeed, one of the Bristol Tea Company’s aspirations over the next few years is to source more teas direct from Small Tea Growers. Currently we offer a beautiful handcrafted Assam from the Kanoka Estate, that has just 8 acres turned over to tea. Kanoka is family run and works with other small tea growers to create a market for several organic, handcrafted teas. Yet we are still keen to support Fairtrade – we feel it does offer a level of traceability and transparency, with large estates prepared to open themselves up to scrutiny by an outside, independent body. Fairtrade are in a good position to highlight these concerns, work with the Industry and other certifications, develop and urge change.